Enrico Fermi (September 29, 1901 – November 28, 1954) was an Italian physicist most noted for his work on the development of the first nuclear reactor, and for his contributions to the development of quantum theory, nuclear and particle physics, and statistical mechanics. Fermi was awarded the Nobel Prize in Physics in 1938 for his work on induced radioactivity. Enrico Fermi was born in Rome, Italy. His father was Alberto Fermi, a Chief Inspector of the Ministry of Communications, and his mother was Ida de Gattis. As a young boy he enjoyed learning physics and mathematics and shared his interests with his brother Giulio. When Giulio died unexpectedly of a throat abscess in 1915, Enrico was distraught, and immersed himself into scientific study to distract himself. According to his own account, each day he would walk in front of the hospital where Giulio died until he became inured to the pain. Later, Enrico befriended another scientifically inclined student named Enrico Persico, and the two together engaged in scientific projects such as building gyroscopes, and measuring the magnetic field of the earth. Fermi's interest in physics was further encouraged when a friend of his father's gave him several books on physics and mathematics, which he read and assimilated. Fermi received his undergraduate and doctoral degree from the Scuola Normale Superiore in Pisa. There was an entrance exam which candidates had to take in order to enter the prestigious institute, which included an essay. For his essay, the 17 year old Fermi chose to derive and solve the Fourier analysis based partial differential equation for waves on a string. The examiner interviewed Fermi and concluded that his essay would have been commendable even for a doctoral degree. At the Scuola Normale Superiore, Fermi teamed up with a fellow student named Franco Rasetti with whom he use to indulge in light hearted pranks. Later, Rasetti became Fermi's close friend and collaborator. Fermi's Ph.D advisor was Luigi Puccianti. In 1924, Fermi spent a semester in Göttingen, and then stayed for a few months in Leiden with Paul Ehrenfest. In 1928, Fermi married Laura Capon and later had a son Giulio ("Judd") Fermi (1936–1997) and a daughter Nella Fermi Weiner (1931–1995). His son worked with the Nobel laureate Max Perutz on the structure of hemoglobin. From January 1925 to the autumn of 1926 he stayed at the University of Florence. In this period he wrote his work on the Fermi-Dirac statistics. When he was only 24 years old, Fermi took a professorship in Rome (the first for atomic physics in Italy, created for him by professor Orso Mario Corbino, director of the Institute of Physics). Corbino helped Fermi in selecting his team, which soon was joined by notable minds like Edoardo Amaldi, Bruno Pontecorvo, Franco Rasetti, and Emilio Segrè. For the theoretical studies only, Ettore Majorana also took part in what was soon nicknamed "the Via Panisperna boys" (after the name of the road in which the Institute had its labs). The group went on with its now famous experiments, but in 1933 Rasetti left Italy for Canada and the United States, Pontecorvo went to France and Segrè left to teach in Palermo. Fermi remained in Rome until 1938, when he received the Nobel Prize for his work in physics. After Fermi received the Nobel prize in Stockholm, he, his wife Laura, and their children emigrated to New York. This was mainly because of the anti-Semitic laws promulgated by the fascist regime of Benito Mussolini which threatened Laura, who was an Italian of the Jewish faith. They arrived in New York and Fermi began working at Columbia University. Later, he moved to the University of Chicago where he worked on construction of the first nuclear reactor. He became a naturalized citizen of the United States of America in 1944. Fermi's most disarming trait was his great modesty, and his ability to do any kind of work, whether creative or routine. It was this quality that made him popular and liked among people of all strata, from other Nobel Laureates to technicians. Henry DeWolf Smyth, who was Chairman of the Princeton Physics department, had once invited Fermi over to do some experiments with the Princeton cyclotron. Walking into the lab one day, Smyth saw the distinguished scientist helping a graduate student move a table, under another student's directions. Another time, a Du Pont executive made a visit to see him at Columbia. Not finding him either in his lab or his office, the executive was surprised to find the Nobel Laureate in the machine shop, cutting sheets of tin with a big pair of shears. Fermi died at age 53 of stomach cancer. Two of his graduate students who assisted him in working on or near the nuclear pile also died of cancer. Fermi and his team knew that such work carried considerable risk but they considered the outcome so vital that they forged ahead with little regard for their own personal safety. As Eugene Wigner wrote: "Ten days before Fermi had died he told me, 'I hope it won't take long.' He had reconciled himself perfectly to his fate." During their time in Rome, Fermi and his group made important contributions to many practical and theoretical aspects of physics. Some of these include the theory of beta decay, and the discovery of slow neutrons, which was to prove pivotal for the working of nuclear reactors. His group also systematically bombarded elements with neutrons, and during their experiments with uranium, narrowly missed observing nuclear fission. At that time, fission was thought to be improbable, if not impossible, mostly on theoretical grounds. While people expected elements with higher atomic number to form from neutron bombardment of lighter elements, nobody expected neutrons to have enough energy to actually split a heavier atom into two light element fragments. However, the chemist Ida Noddack had criticised Fermi's work and had suggested that some of his experiments could have produced lighter elements. At the time, Fermi dismissed this possibility on the basis of calculations. Fermi was well-known for his simplicity in solving problems. Whenever possible, he avoided complicated mathematics and obtained quick results based on order of magnitude estimates. This quality was acknowledged by and influenced many physicists who worked with him, such as Hans Bethe, who spent two semesters working with Fermi in the early 1930s. Fermi also meticulously recorded his calculations in notebooks, he later used them to solve many new problems that he encountered based on these earlier known problems. It was Fermi who gave the neutrino its name. The neutron had just been discovered by Chadwick in 1932. Fermi was giving a lecture and mentioned the ephemeral, neutral particle postulated by Pauli to explain certain experiments. When asked if this was Chadwick's neutron, he replied that no, this is the neutrino, the "little neutral one" in Italian. Fermi (bottom left), Szilárd (second from right on bottom), and the rest of the pile team. After receiving the Nobel Prize, Fermi moved to the United States. Soon after his arrival in New York, he began working at Columbia University. At Columbia, Fermi verified the initial nuclear fission experiment of Hahn and Fritz Strassmann (with the help of Booth and Dunning). Fermi then went to the University of Chicago and began studies that led to the construction of the first nuclear pile Chicago Pile-1. In August of 1939 Leó Szilárd prepared and Albert Einstein signed the famous letter warning President Franklin D. Roosevelt of the probability that the Nazis were planning to build an atomic bomb. Because of Hitler's September 1 invasion of Poland, it was October before they could arrange for the letter to be personally delivered. Roosevelt was concerned enough that the Uranium Committee was assembled and awarded Columbia University the first atomic energy funding of US$6,000. However, due to bureaucratic fears of foreigners doing secret research, the money was not actually issued until Szilárd implored Einstein to send a second letter to the president in the spring of 1940. The money was used in studies which led to the first nuclear reactor — Chicago Pile-1, a massive "atomic pile" of graphite bricks and uranium fuel which went critical on December 2, 1942, built in a squash court under Stagg Field, the football stadium at the University of Chicago. Due to a mistranslation, Soviet reports on Enrico Fermi claimed that his work was performed in a converted "pumpkin field" instead of a "squash court." On Wednesday, December 2, 1942, at 3:25 p.m., the experiment was run successfully, they were able to control the chain-reaction fission of uranium. The power generated by this very first nuclear reactor was just 40 watts—equivalent to a dim light bulb or a burning match—and after just 28 minutes of operation, Fermi ordered the reaction stopped and cadmium strips were inserted to mop up the neutrons and quench the chain reaction. This experiment was a landmark in the quest for energy, and it was typical of Fermi's brilliance. Every step had been carefully planned, every calculation meticulously done by him. When the first self-sustained nuclear chain reaction was achieved, a coded phone call was made to one of the leaders of the Manhattan Project, James Conant: "The Italian navigator has landed in the new world... The natives were very friendly." The chain-reacting pile was important not only for its help in assessing the properties of fission — needed for understanding the internal workings of an atomic bomb — but because it would serve as a pilot plant for the massive reactors which would be created in Hanford, Washington, which would then be used to produce the plutonium needed for the bombs used at the Trinity site and Nagasaki. Eventually, Fermi and Szilárd's reactor work was folded into the Manhattan Project. 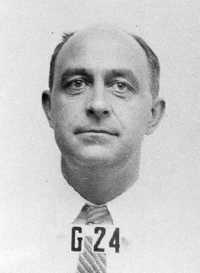 Fermi's ID badge photo from Los Alamos. Fermi moved to Los Alamos in the later stages of the Manhattan Project to serve as a general consultant. He was sitting in the control room of the Hanford B Reactor when it first went critical in 1944. His broad knowledge of many fields of physics was useful in solving problems that were of an interdisciplinary nature. In Fermi's 1954 address to the APS he also said, "Well, this brings us to Pearl Harbor. That is the time when I left Columbia University, and after a few months of commuting between Chicago and New York, eventually moved to Chicago to keep up the work there, and from then on, with a few notable exceptions, the work at Columbia was concentrated on the isotope separation phase of the atomic energy project, initiated by Booth, Dunning and Urey about 1940." After the war, Fermi served for a short time on the General Advisory Committee of the Atomic Energy Commission, a scientific committee chaired by Robert Oppenheimer which advised the commission on nuclear matters and policy. After the detonation of the first Soviet fission bomb in August 1949, he, along with Isidor Rabi, wrote a strongly worded report for the committee which opposed the development of a hydrogen bomb on moral and technical grounds. But Fermi also participated in preliminary work on the hydrogen bomb at Los Alamos as a consultant, and along with Stanislaw Ulam, calculated that the amount of tritium needed for Edward Teller's model of a thermonuclear weapon would be prohibitive, and a fusion reaction could not be assured to propagate even with this large quantity of tritium. In his later years, Fermi did important work in particle physics, especially related to pions and muons. He was also known to be an inspiring teacher at the University of Chicago, and was known for his attention to detail, simplicity, and careful preparation for a lecture. Later, his lecture notes, especially those for quantum mechanics, nuclear physics, and thermodynamics, were transcribed into books which are still in print. Fermi was widely regarded as the only physicist of the twentieth century who excelled both theoretically and experimentally. The well-known historian of physics, C. P. Snow, says about him, "If Fermi had been born a few years earlier, one could well imagine him discovering Rutherford's atomic nucleus, and then developing Bohr's theory of the hydrogen atom. If this sounds like hyperbole, anything about Fermi is likely to sound like hyperbole." Fermi's ability and success stemmed as much from his appraisal of the art of the possible, as from his innate skill and intelligence. He disliked complicated theories, and while he had great mathematical ability, he would never use it when the job could be done much more simply. He was famous for getting quick and accurate answers to problems which would stump other people. An instance of this was seen during the first atomic bomb test in New Mexico on July 16, 1945. As the blast wave reached him, Fermi dropped bits of paper. By measuring the distance they were blown, he could compare to a previously computed table and thus estimate the bomb energy yield. He estimated that the blast was greater than 10 kilotons of TNT, the measured result was 18.6. Later on, this method of getting approximate and quick answers through back of the envelope calculations became informally known as the "Fermi method." When Fermi submitted his famous paper on beta decay to the prestigious journal Nature, the journal's editor turned it down because "it contained speculations which were too remote from reality." Thus, Fermi saw the theory published in Italian and in German before it was published in English. Nature eventually did publish Fermi's report on beta decay on January 16, 1939. He never forgot this experience of being ahead of his time, and used to tell his protégés: "Never be first; try to be second." Time magazine listed Fermi among the top twenty scientists of the century. The Fermilab particle accelerator and physics lab in Batavia, Illinois, is named after him in loving memory from the physics community. Fermi 1 & Fermi 2 nuclear power plants in Newport, Michigan are also named after him, as are many schools such as Enrico Fermi High School in Enfield, Connecticut. In 1952, element 100 on the periodic table of elements was isolated from the debris of a nuclear test. 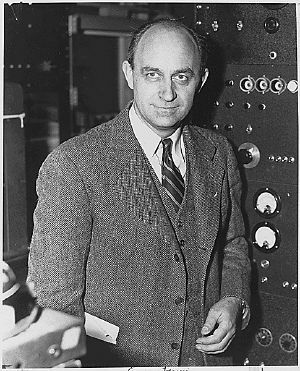 In honor of Fermi's contributions to the scientific community, it was named fermium after him. Since the 1950s, the United States Atomic Energy Commission has named its highest Honor, the Fermi Award, after him. Recipients of the award include well-known scientists like Robert Oppenheimer, Freeman Dyson, John Wheeler and Hans Bethe. The fermi is a non-SI unit of length that is internationally recognized and equivalent to the SI-recognized femtometre, equal to one quadrillionth of a meter, 10-15m. It was given the alternate name fermi in honor of Enrico Fermi. The symbol for both the fermi and the femtometre is fm. The unit is often encountered in nuclear physics as such lengths are characteristic of this scale. A proton, for instance, has a radius of 0.44 fm. ↑ George Johnson, Strange Beauty: Murray Gell-Mann and the Revolution in Twentieth Century Physics (Knopf, 1999, ISBN 978-0679437642). ↑ John Woolard, He Had Firm Grasp Of Physics Investor's Business Daily (2007). Retrieved December 21, 2011. ↑ The "Last Universal Scientist" Takes Charge, Argonne National Laboratory. Retrieved March 4, 2008. ↑ Making enriched uranium was another aspect of the Manhattan Project. ↑ Heavy water is actually a better modulator than carbon, but it is difficult to obtain. Fermi chose to go with the less-effective graphite while Heisenberg chose heavy water for the Nazi's project. When the sole Norwegian source of heavy water was destroyed by the British, the project was ended. ↑ Drawing of the first Atomic Pile, Argonne National Laboratory. Retrieved March 4, 2008. ↑ C. P. Snow, The Physicists (Boston, MA: Little, Brown, 1981, ISBN 0316802212). ↑ Richard Rhodes, The Making of the Atomic Bomb (New York, NY: Simon & Schuster, 1986, ISBN 0671441337), 674. ↑ Richard Rhodes, Atomic Physicist: Enrico Fermi (Time 100) Time Magazine 153(12) Mar. 29, 1999. Retrieved December 21, 2011. Fermi, Laura. Atoms in the Family: My Life with Enrico Fermi. Chicago, IL: University of Chicago Press, 1961. ISBN 0226243672. Johnson, George. Strange Beauty: Murray Gell-Mann and the Revolution in Twentieth Century Physics. New York, NY: Knopf, 1999. ISBN 978-0679437642. Rhodes, Richard. The Making of the Atomic Bomb. New York, NY: Simon & Schuster, 1986. ISBN 0671441337. Snow, C. P. The Physicists. Boston, MA: Little, Brown, 1981. ISBN 0316802212. Segrè, Emilio. Enrico Fermi—Physicist. Chicago, IL: University of Chicago Press,1970. ISBN 0226744728. Zinn W. E. "Fermi and Atomic Energy." Review of Modern Physics 27 (1955):263–268. The University of Chicago, Fermi's audio biography. Retrieved October 10, 2007. All links retrieved August 22, 2017. Enrico Fermi Dead at 53; Architect of Atomic Bomb Obituary, New York Times, November 29, 1954. The discovery of the electron spin - S.A. Goudsmit. This page was last modified on 22 August 2017, at 21:31.